TEASERS Meridian Updates Sooloos Software Costello to Deliver CEDIA EXPO Keynote Crestron Expands DigitalMedia 8G Line BLOGBITS Is the One Wire Dream Finally Here? UI-ology: Shifting and Banding and Smudges…Oh My! Is the One Wire Dream Finally Here? UI-ology: Shifting and Banding and Smudges…Oh My! For more information on CEDIA EXPO and to register, click here. Click here to see what Miller had to say about retrofit solutions, challenges of the “i-centric” consumer, and what Lenbrook has in store for CEDIA EXPO. To recognize excellence in industrial design, RS created the Resi Awards. Category winners will be awarded their Resis at CEDIA EXPO in Indianapolis at a special ceremony on Wednesday September 7, 2011. The winners will then be featured in the October issue of Residential Systems. Click here to check out a list of Resi finalists. See what these manufacturers had to predict for the future of projection screen technology. Check out Dennis Burger’s assessment of WallWizard’s TA55, which he reviewed earlier this year. 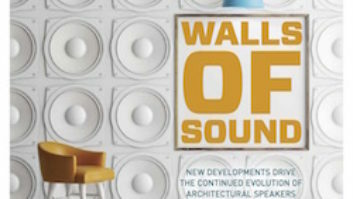 Take a look at the full list of CEDIA EXPO 2011 classes and descriptions.